Like many born before the Apollo Moon landings, I listen to a lot of 20th century music. I’m not only old enough to have amassed actual vinyl. I’m so old, my own first record was released exclusively vinyl, ‘cause that’s what they sold at Tower Records through most of my college years. But despite what my young collaborators and my six-year-old daughter may think, I’ve not succumbed totally to hardening of the musical arteries. You know, like that poor soul you know who just can’t get over (Choose one, please) A. The Death of Biggie Smalls, B. Genesis Fronted by Phil Collins, C. Metallica Haircuts, or D. MTV Ruining Western Civilization. I know there’s good 21st century music. In fact, there’s awesome 21st century music. You just have to look harder. I’m lucky as hell, here, indeed we’re all lucky as hell, because thanks to today’s 24/7 digital now, we no longer have to endure the slog of the life of an after hours club creature to hear new music that’s off the beaten path and, you know, alive. And by that, I don’t mean live. I mean music that defies the narrow confines of music business marketing. In other words, this here meta-fictional funeral playlist, 99 SONGS I WANNA HEAR AT MY WAKE, includes music by new kids, too. As long as it is music that jolts me, body and soul, saying Carpe Diem / Carpe Noctem! Seize the day / Seize the night! Music I imagine wanting to move to ONE MORE TIME. Today, that would be the glossy yet primal sound of Wondaland Arts Society’s Janelle Monáe, a song called “Say You’ll Go.” Listen to her Rocket Love Here. When I bumped into this recording – on one of the many online radio feeds I listen to – I was immediately comfortable, BUT also transported somewhere new. A live contradiction… and a catalyst for dreams. Artists that blend genres do that for me. “How have I NEVER heard this before?,” I wondered, then bought a download (legally, thank you! ), played it on repeat and jumped on search engines to find more on this amazing young artist. What I learned added a fascinating dimension, STORY. 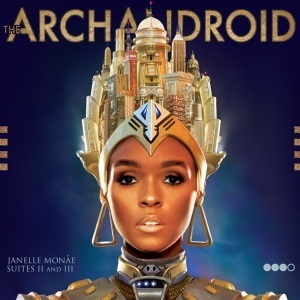 Without digressing too far away from Monáe’s shuddery, hypnotic melody and the undulating rhythm throb – ahhh, thank you for musicians that still play – I learned the track comes from an ambitious sprawl of suites inspired by (among other things) the classic futurist film Metropolis. It’s kind of a pop parable: “Cindi Mayweather,” an incarnation of the singer herself, is a messianic android sent back in time to free us Urban Citizen-Slaves and Set Us Free To Realize Ourselves and Love. I think I’ve got that right. My six-year-old will correct me if I don’t. But I honestly can’t hear this song enough. Reliving my first listen, I felt the presence of an artist that intuitively and intellectually understands and embodies a long continuity of musical traditions, bringing something new to vivid life while celebrating (is that Debussy the angel androids sing at the end?) the past. “Brave enough to go,” for real. Girl is living in a musical comic book… makes Lady Gaga look kinda ordinary. “It’s like Ziggy (David Bowie) Stardust and Stevie (Songs in the Key of Life) Wonder had a mutant kid and sent her to school with Outkast!” I thought. Hey, wait, don’t go! The party’s just starting. 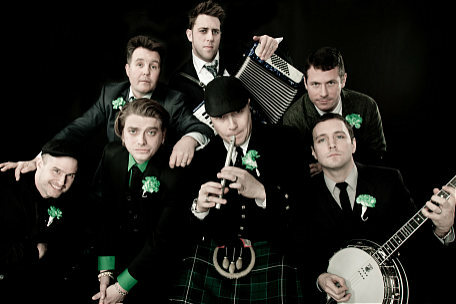 Here’s a pumped-up Dropkick Murphy’s Peg O’ My Heart for your St. Patrick’s Day mosh pit, with love and memories of my grandparents, William and Margaret “Peg” Jones!